There is also no extra-charge “specialty restaurant,” either. You’ll find just two attractive dining areas (beer or wine is included with meals, by the way), two well-decorated lounges, and an open-air bar up on the lido deck. The lido also offers a modest size pool and a hot tub or two. There’s a spa, a hair salon and a boutique around somewhere, although I hardly noticed. The raison d’être of the Aegean Odyssey is adult education, especially in the form of stimulating experiences for the history, culture, or archeology buff, categories in which I cast myself. On my trip, the ship provided two academic lecturers talking about the ancient world. The average intellectual level of the passengers was high, and the median age was also. This is not a cruise for the kiddies, and none were on board during our trip. One group, the Road Scholars (formerly Elderhostel), was also booked on this trip. My wife and I signed on for a standard two week itinerary in April, 2012. It included a dozen ports beginning with Venice, Italy, and finished with an overnight experience in Istanbul, the major city of Turkey. The pièce de résistance for me and many others was that nearly all of the shore excursions were included in the fare. Our only demure is that we took this trip in the early spring, which meant the weather was not always as cooperative as we would have preferred. Pula, Croatia. Roman ruins are sprinkled liberally throughout the city, including one inspired by the Coliseum in Rome. This one is still used for some public events, albeit considerably milder ones than the gladiator contests for which it was built 2000 years ago. Split, Croatia. A prominent feature is a palace built by the Roman emperor Diocletion, so that he could spend his golden years back in his home town. 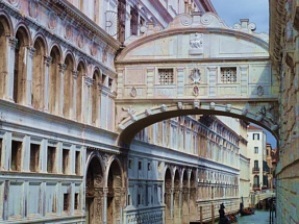 The palace has now been cleverly incorporated into the grid pattern of the city’s streets, and anyone can go to the open market or even rent an apartment in the ancient structure. Korcula, Croatia. This medieval village occupies a steep hill at the end of a peninsula. An old house there purports to be the birthplace of Marco Polo. Dubrovnik, Croatia and Kotor Bay. Dubrovnik, known far and wide as the “Pearl of the Aegean” is the perfect example of an ancient walled city. Following our half-day visit, the ship spent the afternoon cruising the lovely Kotor Bay, in Montenegro. 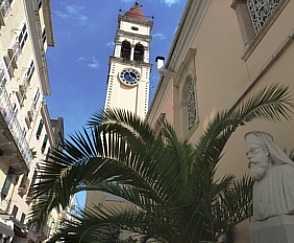 Corfu, Greece. One of the most popular of Greek holiday islands today, its praises were also sung by no less a poet than Homer. The fort at the harbor was built by the Venetians and later finished by the British. Monembasia, Greece. This castle town was known as the Gibraltar of Greece. In our case, we had to skip it. The waves were too high and so the harbormaster closed the port. Rethimon, Crete. Heavy waves prevented our landing in Rethimon, too, but the captain sailed around to the other side of the island to put in to the city of Heraklion, instead. The top experience for me was the included tour to the Palace of Knossos – the seat of the Minoan civilization which flourished around 1000 BC. I was fascinated to read about this place as a youth more than 50 years ago. Santorini, Greece. Because we lost that included half-day trip in Monembasia, , the ship provided an included all-day tour here in Santorini, instead of the half-day originally scheduled. 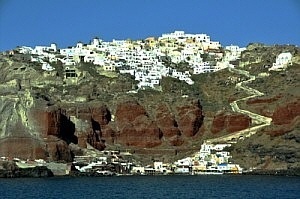 The whitewashed towns cling to the top of sea cliffs which are remnants of an ancient volcano. Naxos, Greece. Like Santorini, it’s an island with very vertical community, but unlike Santorini, this one begins down at the waterfront. 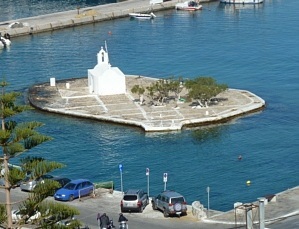 With several beaches, the island is also a popular holiday destination for Europeans during the summer. But we explored it on a fine day in April, when the crowds were absent. Lemnos, Greece. The charm of this small island is that it is relatively undiscovered by the summertime hordes which descend on some other Aegean islands. The ruins of an ancient castle overlook the town. Istanbul, Turkey. The cruise ended in the major city of Turkey. With more than 13 million people, it is established on both sides of the Bosporus, meaning it exists both in Europe and Asia. The main included tour from the ship took in the major sights, including Blue Mosque, the Hagia Sophia, and the Topkapi Palace Museum in a single morning. Fares for the two-week cruise range from $4595 per person double occupancy in inside cabins to $7650 for accommodations in the balcony staterooms. Round-trip air fares from the U.S. are $595 per person, inclusive of all taxes, fees, and surcharges. For day-to-day detail on our own experiences on the Aegean Odyssey, see https://allthingscruise.com/tags/travelwriter .